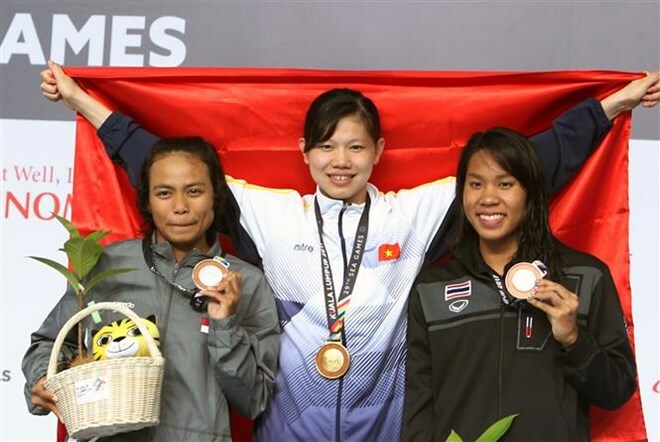 Hanoi (VNA) – Vietnamese swimmer Nguyen Thi Anh Vien on August 21 won a gold medal in the women’s 100m backstroke category at the ongoing 29th Southeast Asia Games (SEA Games 29) in Malaysia. Vien clocked 1:01:89, breaking the previous SEA Games record of 1:02:11. This is the first time Vien triumphed in this category at the region’s largest sport event. The same day, Vien’s teammate Le Thi My Thao secured a silver medal in the women’s 200m butterfly category with a time of 2:12:61. Meanwhile, both Paul Le Nguyen and Nguyen Huu Kim Son finished third in the men’s 50m backstroke and 400m freestyle events respectively, bringing home two bronze medals.